American’s most iconic statue has been quite lonely since it was closed for a face lift in October of 2011. A day after it’s opening, October 29th, 2012, Hurricane Sandy spread her wrath over the East Coast preventing her from visitors once again. The Statue of Liberty was spared direct damage but Liberty Island was not so lucky. An estimated $59 million worth of damage was done to her habitat. Flooding encompassed 75 percent of the island, destroying Lady Liberty’s electrical and communication systems. Visitors have since been forced to admire her beauty from afar while the damage is being repaired. To make matters worse, between the fiscal cliff and budget cuts caused by the sequester it was not looking good for the reopening of Lady Liberty. However, there is good news! Despite all of the chaos, the National Park Service has announced the national monument will reopen on July 4th, 2013. We at Statue.com cannot think of a better way to celebrate the nation’s birthday. We have many Statue of Liberty replicas in our inventory to add spice to your own celebration. We even have a Statue of Liberty Snowman if you need a little cool on the upcoming hot days. 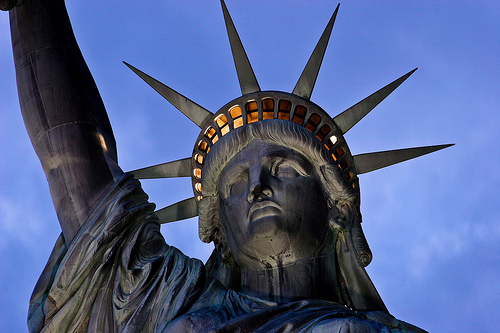 Tell us: Have you visited our Lady of Liberty? What did you take away from the experience?